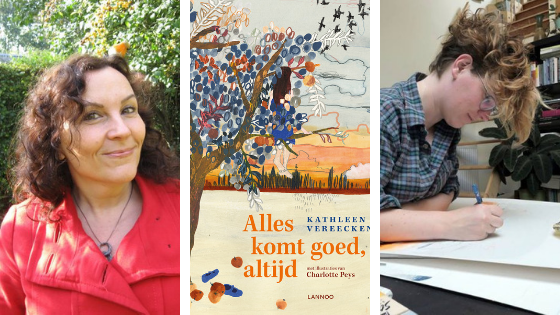 Author Kathleen Vereecken and illustrator Charlotte Peys, both from Flanders, have won the Woutertje Pieterse Prize. Alles komt goed, altijd (Everything is going to be fine, always) has been voted best Dutch-language children's book of last year. The prize, named after a character from Multatuli, is accompanied by a certificate and an amount of €15,000. The prize, awarded in the Flemish Culture House de Brakke Grond, was received as a surprise. Alles komt goed, altijd was considered to be an outsider, because the book received hardly any reviews and had to compete against big names in youth literature. Nominees such as Gideon Samson (Zeb. ), Bart Moeyaert (Tegenwoordig heet iedereen Sorry) and Marjolijn Hof (Lepelsnijder) have often received prizes for their previous work. The jury of the Woutertje Pieterse Prize opted for a "poignant book that looks at the frayed edges of the war with an unsentimental, childlike look". In Alles komt goed, altijd the First World War is experienced by a young girl from the Flemish city of Ypres. Author and screenwriter Kathleen Vereecken (1962) received in 2010 the Boekenleeuw (Book Lion), the most important children's book prize in Flanders, for her historic youth novel Ik denk dat het liefde was (I think it was love). Her historic novel Zijdeman (Silk Man, 2013) will be an animated film. For illustrator Charlotte Peys (1987) it is the first prize. Alles komt goed, altijd is the second book she illustrated. Her illustrations, which deal with the relationship of people with the world around them, have already been shown at numerous exhibitions at home and abroad. Alles komt goed, altijd is published by Lannoo.